As we finish up a rewarding 2015, I believe SCYC has a lot to be grateful for. Our club has exhibited strength in our commitment to camaraderie. Members gave back by sharing their talents and extensive knowledge. Working side by side, we created a new gathering area, a place to relax and exchange stories about our journeys. We shared our love of boating, rafted up together, cooked for our friends, and always were entertained. By-Law changes, previously proposed at the Spring Business Meeting were approved by unanimous vote. In summary, the changes moved the timeline for official installation of officers to take place Jan 1 and run until Dec 31 of the same year. Nomination & election of new officers are to be completed at the Fall Business Meeting, only if uncontested and with majority vote. Ceremonial installation will still take place at the Spring Business Meeting, same as before. Congratulations to the 2016 officers, who were nominated and elected: Nathan Maune as Commodore, Rich Kamens as Vice Commodore, Dan Godwin as Secretary and Doug Miller as Treasurer. We thanked them for agreeing to serve SCYC. The Shipmate Award was presented to Nathan Maune for his significant contributions of time and talents in design, problem resolution, construction and leadership of SCYC volunteers for the new patio, fire pit and modified gazebo. We thanked our creative and talented 2015 Event hosts who kept us active on the water and land, fed and entertained: Dave and Helen Rock, Doug and Brenda Miller, Eddie and Diane Walters, David & Barb Willcox, Mark & Meryl Alexander, Nathan Maune, Don Courtney, Rhonda Ivey, Keir Penny, Ann Hamner, Steve and Laura Twyman, Shannon Doane, Ron Honeycutt, Dan Godwin, Patricia Dionne, Dave and Jan Bachnovic, Craig and Denise Allen. A special thank you was given to our first Share Series Discussion hosts, whose years of practice gave us new ideas on how to keep our crews healthy and safe along with our boats running well: Darren Wohl, Mark Alexander, Glenn Withrow, Rhonda Ivey, Pat Terry and Doug Miller. Steve Sherwood, for his contributions of time and talents to the new patio and especially the generous gazebo modifications, plus new modular furniture and folding serving bar. Eddie Walters and David Willcox, for their many years of service as Race Chairmen. Our 2015 Culinary Team was thanked for spoiling us and keeping us always well fed: Don and Dana Courtney, Karl and Joan Staley, Rich Kamens, Ted Tisty, Kim Thompson, Dave Rock and Paul Sullivan. Patricia Dionne spoke to the club about SCYC branded clothing and accessory purchases to be standardized to one order per year. Members would place orders in February and then purchased items could be picked up at the Spring Business Meeting in March. 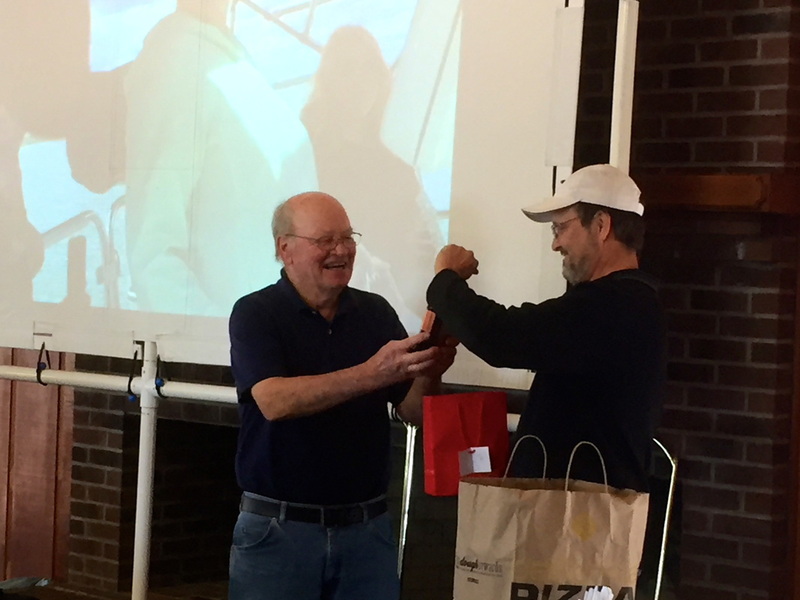 Gifts for Don Courtney were presented by Dan Godwin, from individual contributors, as appreciation for his generosity of years of service to SCYC. In addition, a life-time award, from SCYC was presented by Diane Walters. 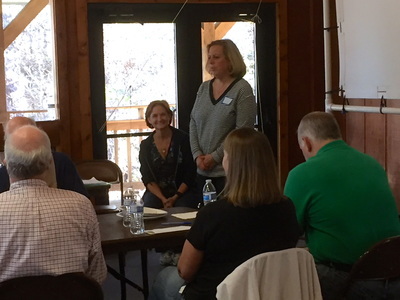 New members present, were welcomed and introduced: Michelle Nicely and Ernie Winings plus Greg and Margaret Miller. Charles Robinson was acknowledged and thanked for Steele Creek Marina’s many resources; materials and talents contributed in the construction of the new patio, fire pit and gazebo modifications. 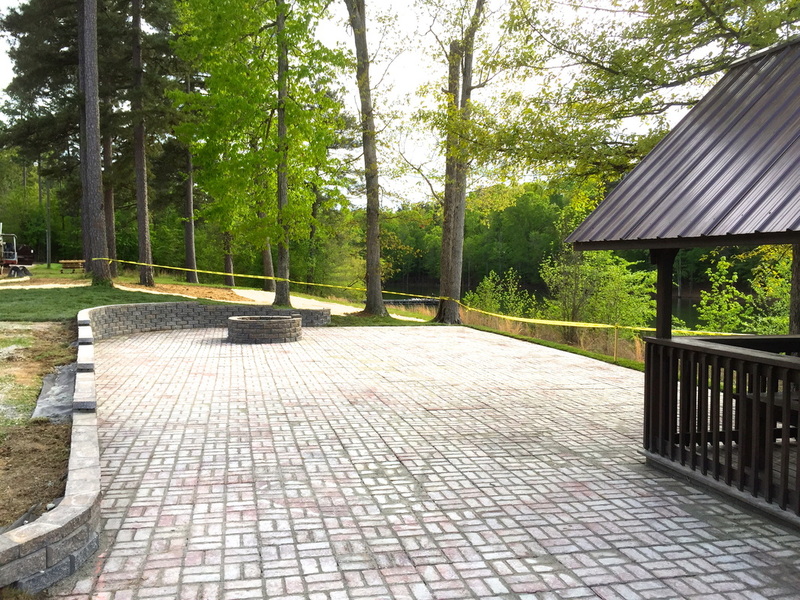 Patio and gazebo project - thank you to Nathan, Barbara & all SCYC members. Wash pad - Close to being approved by Corps of Engineers; will take approx. 2 months after approval to be up and running. 20 amp slips - Unless you’re on the boat, power cords must be unplugged. Amp usage - Marina will be monitoring amp usage with amp meters to make sure space heaters aren’t being used since they pose a fire hazard. Member Appreciation Event - will occur again Memorial Day weekend, 2016. Billing or slip questions – All inquiries should be directed only to Jill Robinson at jill@steelecreekmarina.net, and not the marina store employees. WiFi - DSL is being used. TWC is not cost-effective. Water - Will be turned off after 3 consecutive days of below freezing. Recycle bins - Removed since locals collecting cans are leaving a mess at the marina. Earlier in November, we enjoyed our 1st Annual Dock Crawl. Threatening storms didn’t hinder our spirits, as we moved from host boat to host boat, eating their great food, delicious cocktails, wine and special hot chocolate. Poker cards were accumulated with each visit. I refuse to acknowledge that there was any “competitive sharing” taking place amongst many individuals (including myself) but the best “competitive sharing” poker hand prize was awarded to Eddie Walters as we continued the fun with yummy deserts at the gazebo. A great time was had by all and we thank Dan Godwin & Patricia Dionne, Dave & Jan Bachnovic, and Craig & Denise Allen for hosting a great event. As colder temperatures settle in, please don’t forget to winterize your boats. I hope everyone has a wonderful holiday season. Meryl Masters-Alexander is coordinating another New Years event so look for her communications for details. I can vouch for it as a really fun way to spend your New Year’s celebration. It has been an honor to serve as your Commodore for 2015. I couldn’t have done it, however without the contributing efforts of my fellow officers: Diane Walters, Laura Maroglou and Doug Miller and thank them for their support! A really rewarding and fun ride, I recommend any of our SCYC officer positions to our members that might be considering it in future years. Up next is Nathan, Rich, Dan and Doug. I am excited about these guys. Their many talents that they bring, will make for a great group of officers! I hope many of our members (new and old) will consider also contributing to our 2016 events because when that happens, SCYC is at its best. Fall Business Meeting & Elections Up Next! Join us at the Glass House, Henderson Point for our all important SCYC Fall Business Meeting is this Saturday, November 14th, in which we nominate and elect our new slate of officers for 2016. We will also present the Shipmate of the Year award and take a look back at the many contributors that motivated and inspired us, and kept us entertained! 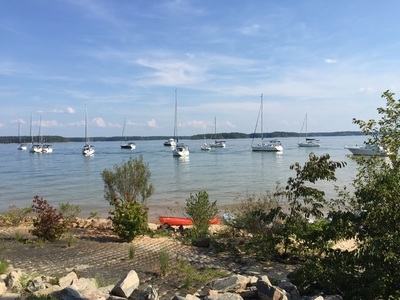 As well, Charles Robinson, owner of Steele Creek Marina will be stopping by to share with us the latest on the marina upgrades. Don Courtney has indicated that pork barbeque and fried chicken are on the menu and lunch will be served at 12 noon. Join us anytime, beginning at 10am to grab some coffee and catch up with new and old friends. Don’t forget to bring a side dish or desert to share. So that we are able to prepare and purchase the appropriate amount of food, please RSVP with the number of attendees, as soon as possible, preferably by Thursday at 12:00 noon. I’ve attached the list of changes being made to the By-Laws that was presented and reviewed at our Spring Business Meeting. We will vote on amending our By-laws to include these changes. If you’re able, bring (on a flash drive) any of your favorite photos from the past year, that you can share for our slide show. From I-85, take exit 214 and follow Highway 39 North for approximately 13.5 miles. Turn right on Rock Spring Church Rd and go about 2.5 miles. Turn right onto Reverend Henderson Church Rd and travel about 1 mile to Henderson Point. After passing through the Entrance station, take the road on the left, which winds around to the Glass House Community Building, overlooking the large parking lot and our beautiful Kerr Lake. We look forward to seeing you all this Saturday! Please RSVP as soon as possible. 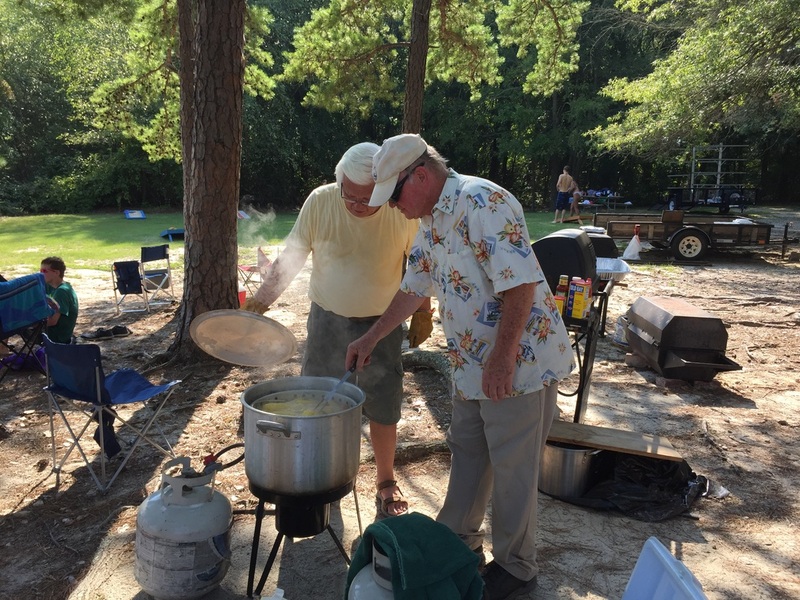 Thanks to Don Courtney and his team of chefs: Dana, Carl, Joan, Rich, Ted and everyone else who pitched in for another delightful Fish Fry, last month! We were treated again to a wonderful variety of specialties of the house and a great evening to catch up with everyone. This weekend the Hot Dog burgee is up for grabs with another installment of the Hot Dog race and dinner, hosted by Ron Honeycutt. Skippers Meeting starts at 10am this Saturday morning and the dinner will begin between 5 and 5:30. Bring a dish to share. Immediately following the hot dog dinner and burgee exchange this Saturday, Doug Miller will host a Share Series discussion about Diesel Engines 101. Bring your questions and as colder temperatures are not so far away, this information will be quite timely! If you haven’t yet signed up to be a host boat for the 1st Annual SCYC Dock Crawl, on November 7th, please do so ASAP. Sign ups were requested by October 21st but ask for forgiveness from Dan Godwin by emailing him now: wespete6@yahoo.com. A great evening of fun, a chance to get a winning hand at poker and especially our SCYC camaraderie is in store as we move from host boat to host boat, drink their drinks and snack on their snacks. What else could you ask for in a happy hour event? Also ahead on the same day, November 7th, is our last Fun Race of the season. As well, don’t forget our Fall Business Meeting on November 14th at the Glass House at Henderson Point in which we will nominate and potentially vote on our next group of SCYC officers. Please consider doing your part to contributing to the 2016 fun and continued successes of SCYC! Please contact me or any of our officers if you are interested in being nominated. Hopefully we’ll see you out on the water this weekend for the race or at the Gazebo for dogs! We anxiously await our annual Fish Fry, compliments of Don Courtney, this Saturday, September 19th with appetizers at 4-4:30pm and dinner at 5pm. Please RSVP to Diane’s google form that was sent out to each of you this week. She is asking for all responses by this Wednesday, Sept 16 by 9:00 AM! We need an accurate tally to determine how much fish to purchase, otherwise we’ll all be eating hush puppies! ALSO, everyone please bring your much desired and scrumptious side dishes and desserts, your beverages and a chair since we will be up by the shed. Also earlier that same day, we will have another Fun Race. Skippers meeting is at 10am, at end of C dock. All racers- new and old are encouraged to join in. 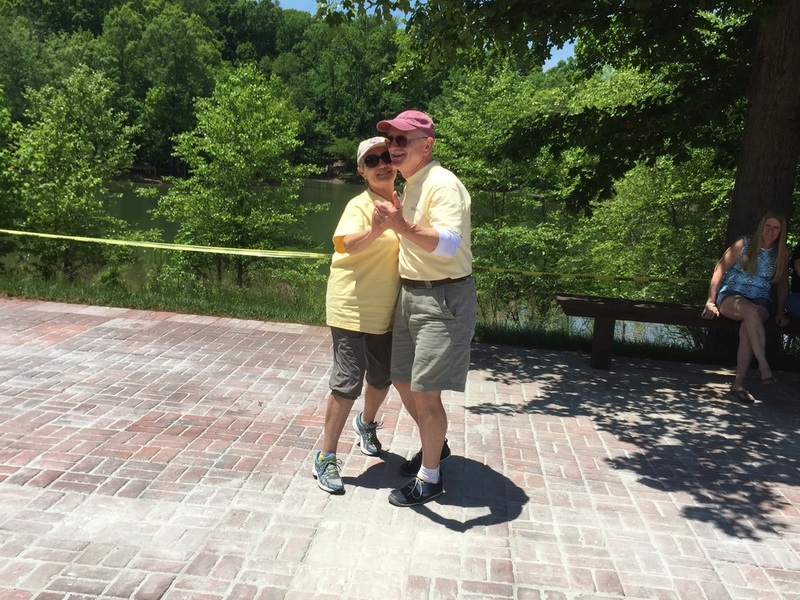 On a saddened note, we learned this past Saturday that Connie has returned to Duke Hospital this week because of blood clots in her lungs as well as her operated leg. Please extend your prayers and positive thoughts. Thank you to all 21 participants of Saturday’s annual Treasure Hunt. David was able to throw in some new twists again this year to keep you on your toes. (Thanks honey for a fun day!) As we passed (threw) a cheaper version of Grey Poupon between the boats and set out solving clues and puzzles, a few new sailors learned to navigate with a compass rose! A skill they didn’t know that they missed until Saturday! J A big thank you to Darren and Sigal, aboard Sea Gal, Ted and John, aboard Aquilla, and Keir and Rhonda aboard Sapphire (and Don Courtney for offering Palisades, although we did not race her this time) for opening up their boats to us as our host boats. Also thank you to Doug for monitoring and Rich for helping in the setup of clues Saturday morning. Congratulations to Keir and Rhonda for taking 1st place this year along with Don, Bobbette and Dan as their fellow treasure seekers. They will remind us of their win as they fly the Treasure Hunt burgee until next year. After the race, we huddled under the gazebo in the rain and enjoyed the spoils of the hunt including: shrimp cocktail, fine cheeses and meats, crab dips, fruit and vegetable trays and plenty of beverages! Don’t forget the upcoming Bluenose race on September 26th. Steve Twyman sent out the details earlier this week! Let him know if you’re racing. Our Treasure Hunt event is coming up this Saturday on September 12th hosted by David and myself. A fun time for all is expected again but with a few twists and turns from previous years. We’ll gather at the end of C dock at 11:00 am. All treasure hunters will be assigned to one of our gracious, yet competitive host boats: Aquilla, Palisades, Sea Gal and Sapphire. There will be something for everyone, where creativity, strategy, nautical knowledge and a willingness to go for the gold (treasure) will be your mission. Prizes afterwards to be enjoyed (consumed) and bragging rights to fly the coveted “Treasure Hunt” burgee! Please email me, commodore@steelecreekyachtclub.org if you are planning on attending so that we can make sure we have enough prizes. Last year we had 43 participants and the event is expected to last just 2-3 hours, so hope to see everyone join in for some more friendly competition this year! From the business side of SCYC, I’d like to put out a special Call To Action to all members to consider volunteering their time and talents as one of next year’s 2016 SCYC Officers! As some of you may have heard, I have taken on a new career as a high school Marketing teacher and with so much to learn, my free time is very limited. Our Vice-Commodore, Diane Walters’ schedule has also become very busy lately with attending to her mom’s needs after her injury and Diane expects to be out of town every other weekend. So if you ask, what’s involved by volunteering to be an officer? It’s important to realize when you consider this idea, you don’t need to follow my lead as next year’s Commodore, or Dennis’, or Steve’s, Meryl’s, Helen’s, or Ted’s! You can design your contributions and efforts as an officer, as you see fit and manage it in a way that works for you. Actually most of the effort takes place in December (when you’re not out on the water much, anyhow) and your task is communicating with previous event hosts to select a date for the coming year’s calendar. From there, it’s just communications about the events that are already mapped out. Keep in mind, the previous officers and plenty of others are always willing to help guide you and assist. SCYC members, please give it serious consideration. It really is gratifying to give back to the club that has given so much to us all. Nominations will be taken on November 14th, at our Fall Business Meeting. Do me a favor and drop me a line if you have questions or are interested in putting your name in the hat! 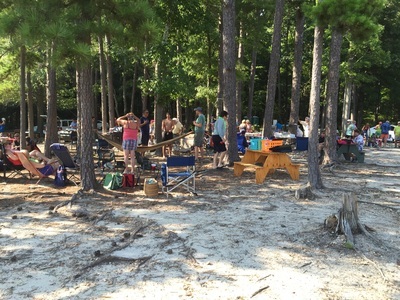 Our August Luau at the Henderson Group Camp site was a great weekend shared with old and new friends, good weather and great food. Thank you Don & Dana Courtney, Carl & Joan Staley, Rich Kamens, and Kim Thompson for food planning, purchasing and cooking plus assisting food prep from Regina Blalock and Laura Maroglou. A shout out to all the volunteers that made the Luau happen, and helped in so many ways: digging out our fire pit, donating & delivering firewood, unloading firewood, setting up canopies, grills and prep tables, empting out our shed full of supplies and the next day stocking it back up, bringing over your personal corn hole games and SCM’s game, Sunday’s campsite clean-up, being game coordinators for our Corn Hole Tournament, Egg Toss and Canoe Tug-o-War and the ten brave women and ten brave men that were willing to show their creative interpretations during our much entertaining and competitive women’s vs. men’s Charades game. Thank you all, we couldn’t have done it without you! In addition, thanks to Laura Twyman, Ann Hammer, Shannon Doane and Brenda Miller for hosting our 4th Annual Dog Days of Summer Event, this past August 29th. 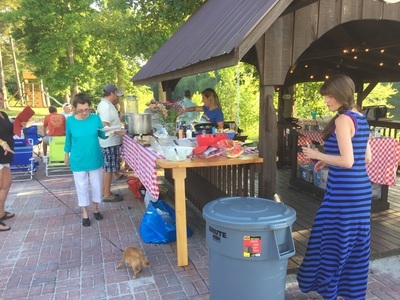 Unfortunately, I wasn’t able to attend but it was reported, they collected $340 in donations to a local shelter, plus everyone enjoyed a hot dog super and a whole bunch of dog-lovin fun! Laura wrote: 35 people and 9 dogs attended our 4th annual Dog Days of Summer, hosted by Ann Hamner, Shannon Doane, Brenda Miller and Laura Twyman. This year we added luminaries which could be donated In Honor or In Memory of our past furry shipmates, which was an added source of donations for the shelter. We had a record amount of supplies and money donated to help many homeless cats and dogs. The 2015 winner of the Dog/Owner look-a-like contest goes to Rick Connelly and Sparky. Thank you to the so many of you who helped Dog Days to be such a successful event! Apparently, If you haven’t had a chance to donate, there’s still time, so top by Bon Bimi, to make a contribution. Thanks also to Herb Estes who took some great photos of the event. Go to our photos tab of www.steelecreekyachtclub.org to seem them all. So many of you have remarked on FB about the incredibly satisfying times that we’ve been enjoying on the water during the past few months with friends, family and great weather. We are all so fortunate to share these moments together, let’s keep ‘em coming! Right about now, I’m sure everyone is hunting down their grass skirts, coconut shelled tops, floral Hawaiian shirts and matching flip flops, therefore I better share our Luau plans…. The Luau is a weekend long event for those that are interested, starting Friday, August 14 and ending Sunday, August 16th. 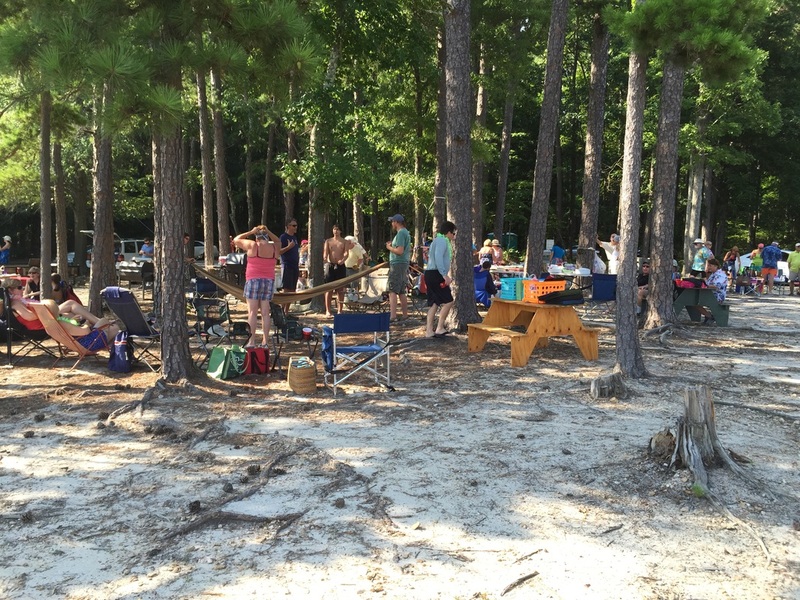 We will be located at the Henderson Point Group Campground, so come by land or water! If you can not make it there for the entire weekend, then be sure you join us for our big Luau dinner on Saturday. 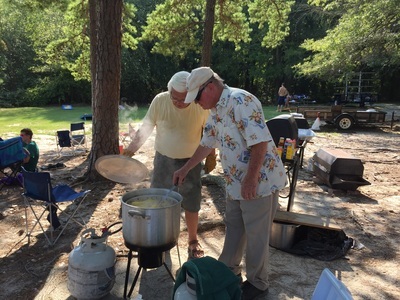 Don Courtney, along with Rich Kamens and Kim Thompson & crew are going spoil us again with a Low Country Boil and grilled chicken. Apparently, in an effort to keep both the cooks in check and prevent a mob scene at dinnertime, Don says he’ll put out some shrimp, as appetizers, around early afternoon. Then at 4:00 pm, we’ll enjoy the full dinner along with your yummy side dishes and desserts to share! We’ll also have some games and a bonfire, to top it all off. Don’t forget also to bring your chairs and beverages. Assist Don on Friday to unload his trailer full of grills, etc. Watch for our Vice-Commodore, Diane Walters’ email in August with another reminder and RSVP for you to complete. Since the food purchases are very expensive and we want to have the correct quantities, please make sure you respond. Guests are welcome but we do charge a $5/guest fee, payable that day to any of the officers. Looking back, on June 13th we had a double-header SCYC day, starting with a Fun Race, sponsored by Thanos Maroglou. From a goal post starting line, the racers headed south to buoy L, north to buoy C and back to the goal posts. But with very mixed wind, it eventually died out and Thanos called the race off early. Add some very hot temperatures, we all were thankful, at that point for the call. Eddie Walters and David Willcox, our race co-chairs, incorporated a new race format that day, dividing the racers into three fleets: Blue, Red and White. Eleven boats racing in total, we had four boats in the Blue fleet with Tenacious taking the win, and three boats in Red with Honeycraft with the win. In the White fleet there were four boats racing. It was neck and neck between Aquilla and Swedish Fish but agreed in the end to award the finish to Swedish Fish. That same evening, Rhonda Ivey and Keir Penny hosted a not to be forgotten, Italian Night. SCYC’s first dinner event utilizing our new patio, gazebo and mobile furniture, the large turnout was still very comfortable and accommodating. The Italian mood was set with red-checkered tablecloths, flowers, candles, music, spaghetti & meatballs and punch. After dinner, the KISS CAM made its way through the crowd to create some great photos and memories. Thanks Rhonda and Keir for creating such a charming event! 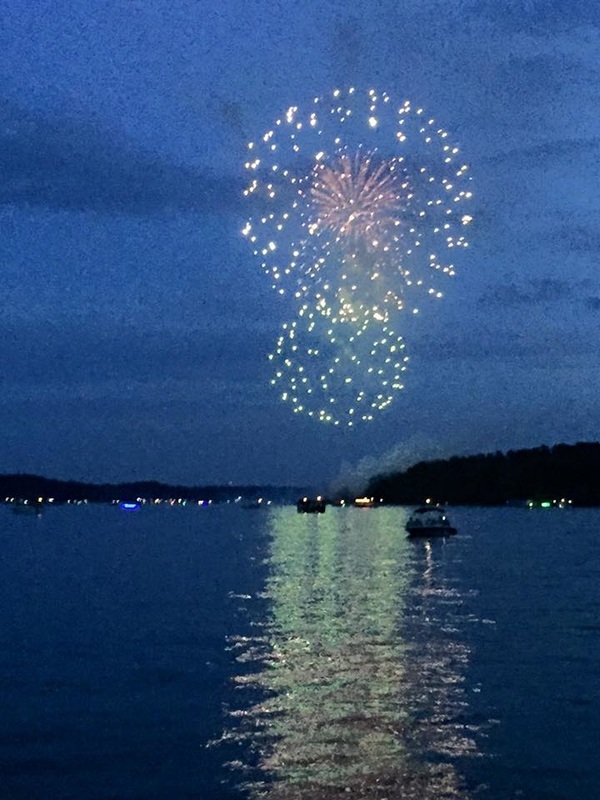 The July 4th Fireworks were represented well by SCYC members, at multiple raft-ups across from Satterwhite Point. 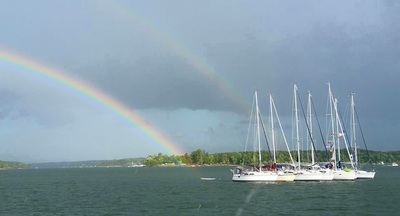 The skies put on some extraordinary shows the entire day with grey clouds in the late morning, then sun, then thunder clouds leading to the most brilliant double rainbow, just across the water from us all. 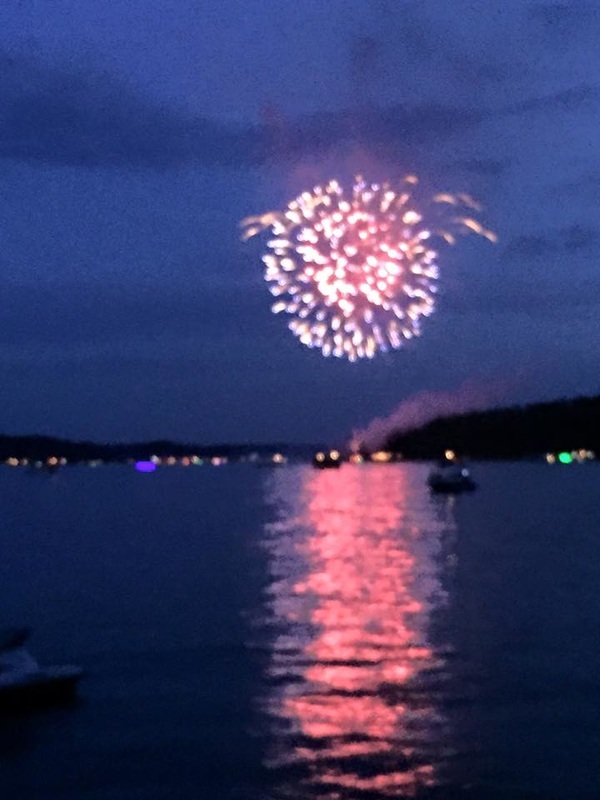 The fireworks were fun to watch and finished up with great timing because a gentle rain fell as boats made their way back to the marina or into their safe anchorages for the night. As summer continues on, just like the mayflies, (thanks Bob Harrison and Don Courtney for this week’s biology and reproduction lessons), we remind ourselves of the wonderful opportunity, as boaters, we have to spend our leisure time with good friends (old and new) and in the presence of nature. Our beautiful Kerr Lake, that place we call, our home away from home. Good times were had by all, during our fun-filled Memorial Day Weekend, with the most remarkable weather! 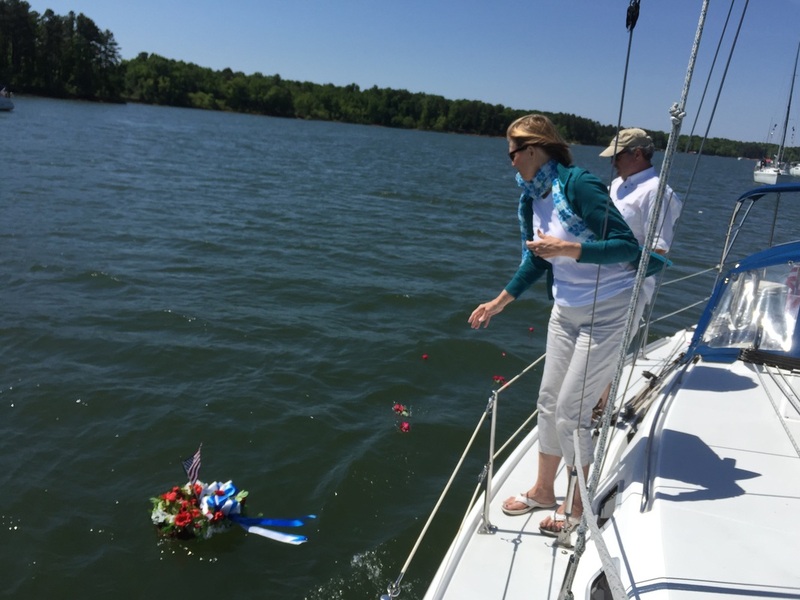 It all kicked off on Saturday with our annual Memorial to the Fallen & Blessing of the Fleet, hosted by Don & Dana Courtney and Paul Sullivan, all aboard Palisades. After Paul delivered a heart-felt prayer and ceremony via VHF 71, twenty-one boats steamed by the floating wreath and placed flowers nearby, to pay tribute to the memory of friends and family that served our country and those that had fallen. Soon after, we headed back to the marina for SCM’s Customer Appreciation Day festivities where new and old friends shared good food, games and dancing to a live band. Thanks Charles and Jill Robinson! Later that afternoon a good number of boats headed out for our annual voyage to Clarksville with an overnight stopover, this time at Cow Pasture. M&M was our anchor boat and held us steady with a record-setting 9 boats on one anchor! 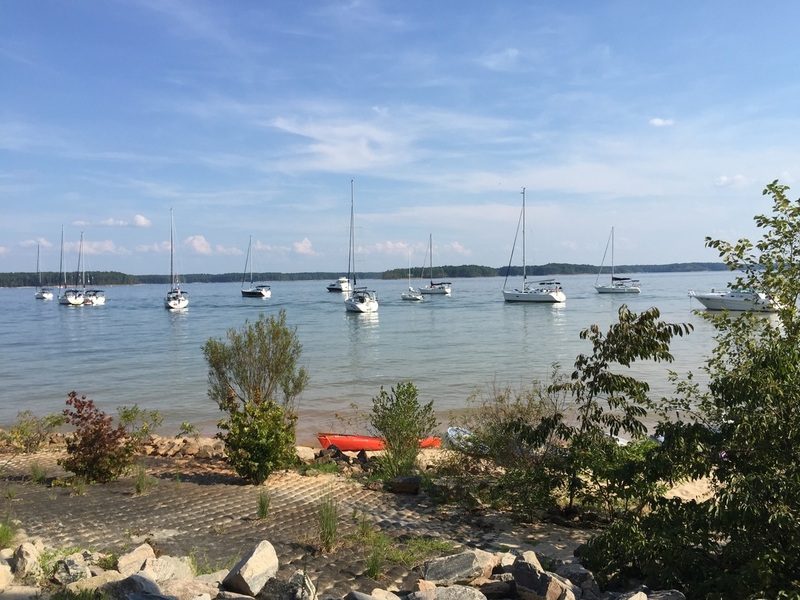 Sunday’s sail brought a total of 8 boats to anchor in Clarksville waters and many more to arrive by car for forty-some members sharing dinner at the Pizza Pub. Winds were stronger on Monday with more sunny skies as together we headed home with a Hibernia Point raft-up, anchored by Zephyros to celebrate a fabulous weekend. Other than the perfect weather, one of the best parts of the weekend was a shared sense of unity whereby sailors looked after sailors, giving guidance and watch along the way, and radio communications to alert others as the wind conditions changed. A great weekend to be a proud member of SCYC! In case you missed some of our other May events, on May 2 we had a double-header beginning with Rhonda Ivey’s Share Series discussion: “Reiki, The Healing Touch”. We thank Rhonda for enlightening us as we envisioned a healing process of touch, capable of activating an improved state of well-being and better health. 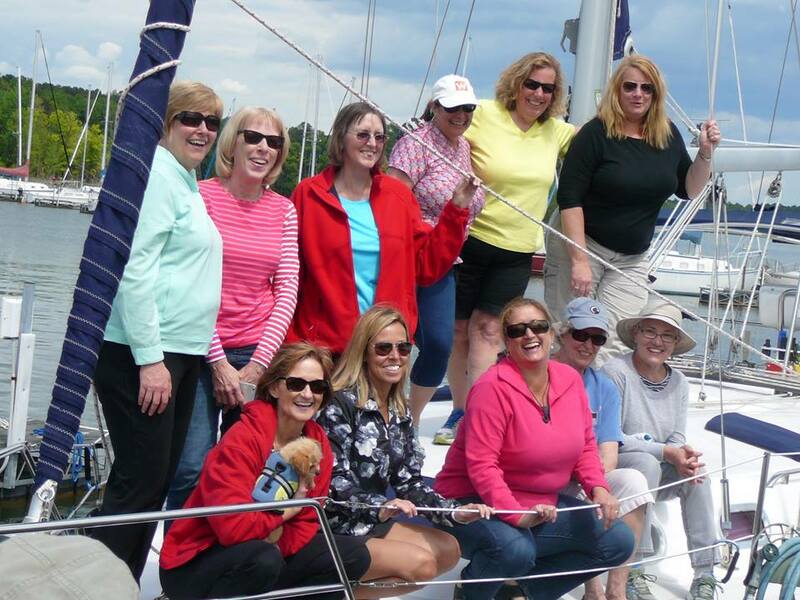 Later that day, Meryl Masters-Alexander kindly invited ten women to join her for our first entry in “Ladies at the Helm” aboard M&M, including: Lisa, Shannon, Ann, Jane, Laura M, Connie, Vicky, Rhonda, Diane and myself. Not only did we learn some good sailing techniques, but shared giggles and grins, and vowed to do it again soon with more women already placing advance reservations for the next voyage! 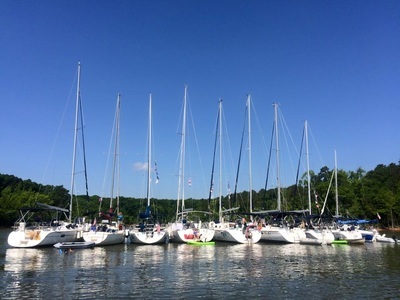 Eddie Walter’s May 16th Gilligan Island Fun Race included 13 boats for a twenty-some mile spinnaker / wing-on-wing leg to the dam, followed by a reach, just past the Rock Wall to Gilligan’s Island and then back to the start. While rounding the island, Gilligan’s reputation held true as the waters got very shallow for two boats and unfortunately light air for others, but eventually the wind picked up for an exciting finish. Tenacious took the win for A Fleet and Honeycraft took the B Fleet win. Finally last Saturday, SCYC was fortunate to participate in Pat Terry’s Share Series discussion on “Boating Safety”. We were all fully engaged in the topic and shared some of our own safety strategies as Pat lead us through many ways to pay closer attention to improving the safety of our precious crews and boats. Did you know that it’s a smart idea to have a fire extinguisher within easy reach of your cabin berth? 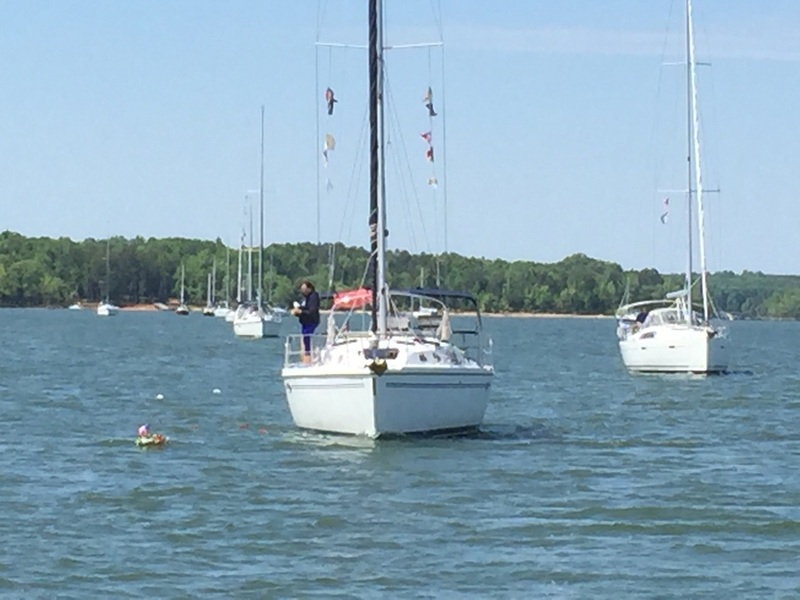 Do you know which is the best man-overboard maneuver for a lake? If you wake up in the middle of the night and step into water, how long would it take for you to quickly and accurately recall how many through-holes are on your boat? Did you know that if you are pulled over for a safety inspection, that in order for your inflatable PFD to be counted, you have to be wearing it? 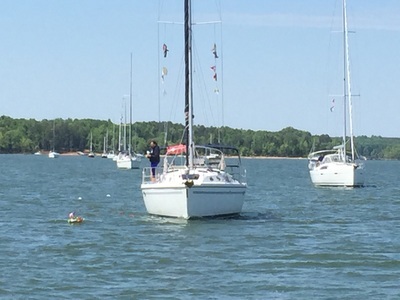 If you missed Pat’s event and want a copy of his outline/handout, email commodore@steelecreekyachtclub.org.More importantly, start the discussion this week with your crew on how to improve the safety of your boat! Looking ahead to this Saturday, June 13th is our next double header starting with Thanos Maroglou’s Fun Race: Captain’s meeting at 10am, staggered start at 11am. Plus that evening, the wonderfully anticipated Italian Night, hosted by Rhonda Ivey and Keir Penny at 6pm on our new patio! (Can you say LEVEL seating & LEVEL food tables??) Don’t forget your favorite Italian dish to share and bring a chair, if you wish. As we get closer, we’ll be looking for a volunteer to be the anchor boat for the Satterwhite Point Fireworks raft up on Saturday, July 4. 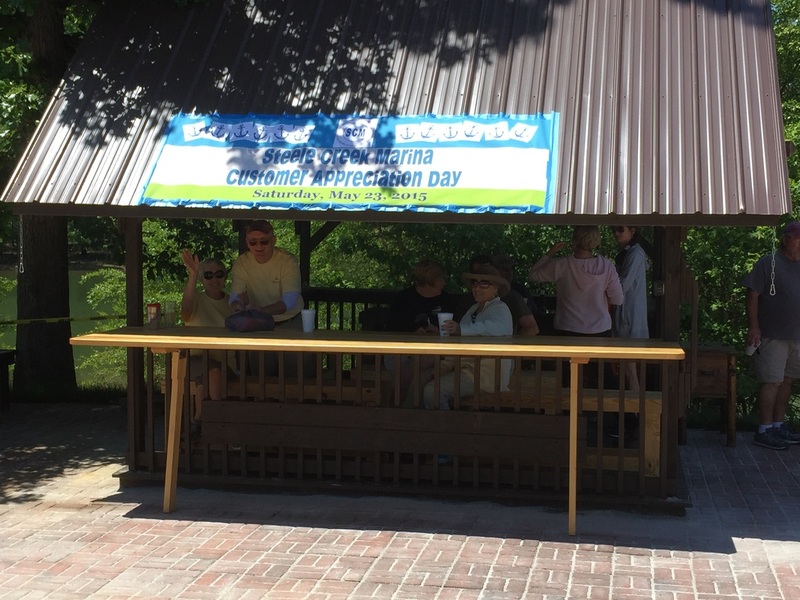 We collectively thank all the many SCYC volunteers that pulled together to create an awesome patio and improvements to the gazebo! Our volunteers carried, swept, shoveled, tapped, leveled and kept our spirits grateful, while working shoulder to shoulder, we could proudly envision what a wonderful space we were constructing together. Additional thanks to: Nathan Maune, Diane Walters, Steve Sherwood, Helen Rock and Charles & Jill Robinson, SCM & staff. Nathan -- we knew we wanted a patio but you gave us so much more. Thankful for your incredible design and positive leadership as you lead our members with skillful knowledge and direction. We further acknowledge that you put in many long hours, before ever breaking ground and several days off of work to accomplish this goal. Diane -- thank you, as always for your guidance, ideas and communications with our members, as it was such an integral portion of the project! Steve -- your hard work all day on Friday was a huge plus, alongside Nathan as you guys “paved” our way and readied our volunteers for a productive Saturday & Sunday. We continue our appreciation of Steve’s millwork talents (Steve is owner of http://www.MullisMillwork.com, 919-496-5993), as he crafts more exciting modifications to the gazebo, so that we can improve utilization and create flexible accommodations. Helen -- along with your volunteers, the enclosures you are designing and creating from our worn out sails will extend our enjoyment, way out to the coldest and wettest days ahead and we thank you! Charles Robinson -- we thank you very much for your total SCM commitment and support to the project, endless resources, raising up the gazebo (yup, he did that too) and excellent grading/ ground prep to create the perfect “foundation” for FUN! Additional follow up from two weeks ago, we enjoyed an inspiring and healthy Share Series discussion about Reiki with Rhonda Ivey and learned of her healing touch. Thank you, Rhonda for opening our minds up to new ideas and thinking! Later that same day, Meryl Masters-Alexander treated the women sailors to our first ever “Ladies at the Helm” instructional and fun sail on M&M. Enthusiastically enjoyed by Meryl’s crew: Ann, Shannon, Rhonda, Vicky, Jane, Connie, Lisa, Laura M, Diane and myself, we decided we would do a repeat real soon. Thanks Meryl for the wonderful event idea and sharing your patience and sailing skills! Eddie Walter’s Gilligan Island Fun Race this Saturday, May 16, racers meeting at 9:30am, end of C dock. 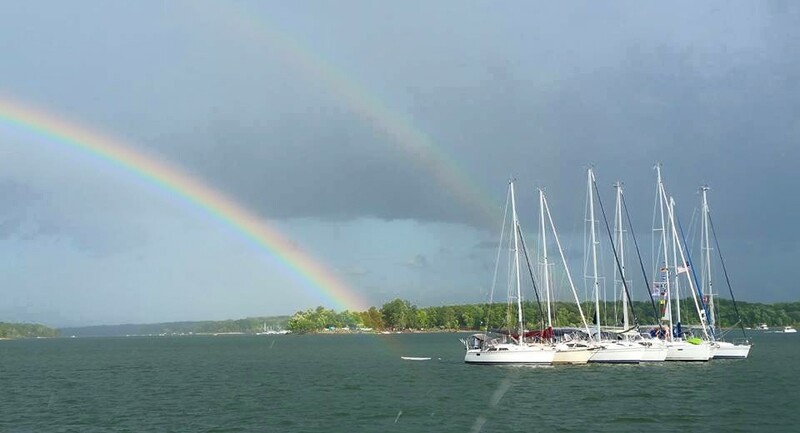 Don Courtney’s Blessing of the Fleet and Memorial to the Fallen: Saturday, May 23, 11am, outside the marina's no wake zone, at the 'T' intersection with Nutbush Creek. See also Don's email from last Sunday for more details. 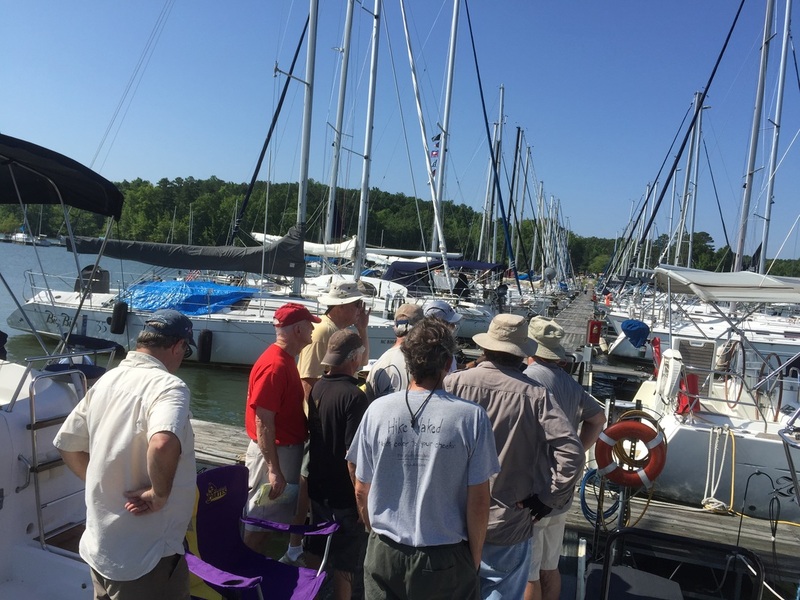 Clarksville Sail/Motor: Depart Sunday, May 24 10am (informal). SCYC Dinner at the Pizza Pub, 401 Virginia Ave, Clarksville, VA: Sunday, May 24, 6pm. Arrive by boat or by car (30 min drive). Note, please RSVP on our Steele Creek Yacht Club group Facebook page or email Commodore@steelecreekyachtclub.org so that we can advise Pizza Pub of how many to prepare for. 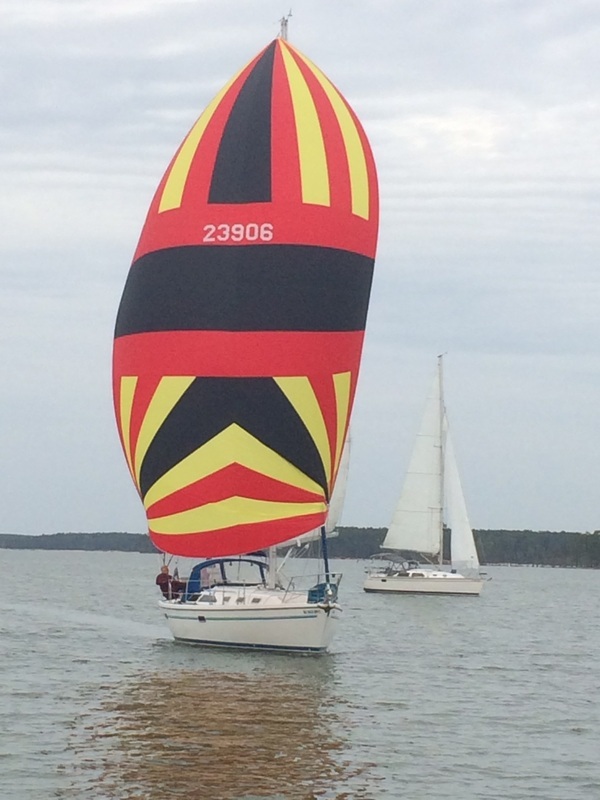 Also mention if you are participating in the Clarksville Sail /Motor. Share Series: “Boating Safety” with Pat Terry scheduled for June 6. Includes discussions of safety ideas while on land and then we'll venture out onto the water for some safe boating practice drills. One final note, SCM has changed the entry codes at the marina’s front gate. Make sure you stop by the marina store to receive your new code. We're looking forward to another fun Memorial Day Weekend! Our traditional schedule is shifting this year due to Steele Creek Marina's Customer Appreciation Day on Saturday, May 23, 11:00 am-5:00 pm. We wanted to show our support to Charles and Jill Robinson and the many improvements planned and those already made to our marina community. Hopefully you RSVP'd to their email from April 28th and will be able to attend too. The day starts out with our annual Blessing of the Fleet and Memorial to the Fallen, just east of the marina at 11:00 am on Saturday. See yesterday's email from Don Courtney for details. At Don's great suggestion, we asked to incorporate this event into SCM's Customer Appreciation celebration and potentially increase the involvement from all SCM tenants, not just SCYC. They agreed it was a wonderful addition to the day's festivities. 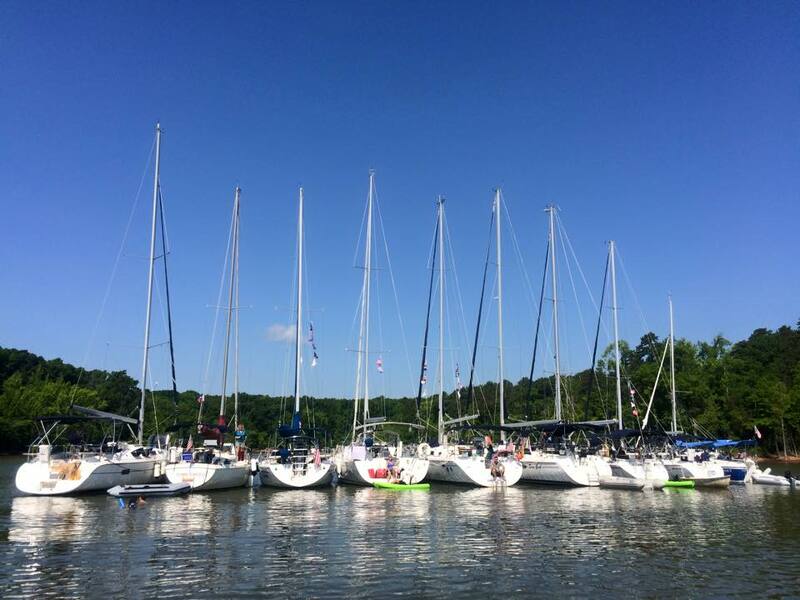 On Sunday, May 24th we'll embark on our Clarksville Sail, leaving the marina at approximately 10:00 am. Some may prefer to head out Saturday afternoon, the choice is yours since this is an informal event. It usually takes 3.5 hours to motor and longer if you're sailing, depending on the wind. If you sail, motor by boat or prefer to drive by car (30 minute drive), we'll meet for our annual Pizza Pub Dinner at 6:00 pm on Sunday. Located at 401 Virginia Ave, Clarksville, Va 23927. Usually we have 40-50 join for dinner so it's always a fun time! and let me know how many are coming so that Pizza Pub will be ready for us! If you're interested in participating in the group sail, let me know that too and when you are planning on departing. Spring Update & All Hands On Deck! ALL HANDS ON DECK! SCYC is moving full-steam-ahead, participating in a big PATIO construction project this coming weekend, April 24, 25 and 26! We all look forward to seeing a big turnout so that we can start and complete it, in one full weekend! If you’ve ever attended any of our pot-luck suppers in the past and experienced awkward, sloping spaces to congregate and leaning picnic tables, we hope you’ll make the effort—a little or a lot, just show up! If you can respond to our Vice Commodore’s invitation email of April 8th or go to the link on the SCYC group Facebook page, please RSVP to help with our planning. Finally, If you just can’t find it, send me an email at commodore@steelecreekyachtclub.org and let me know what day you can pitch in. Bring some work gloves and shoes, plus any tools, wheelbarrows, shovels or rakes, etc. Hope you have been enjoying the many fun events so far. 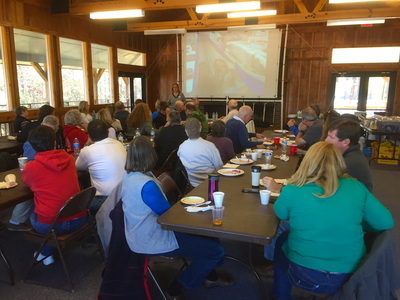 At our Spring Business Meeting, we had 59 members attend with a delicious shrimp & grits brunch prepared by Don, Dana, Paul, Dave, Kim, Connie, Rich, and Meryl. 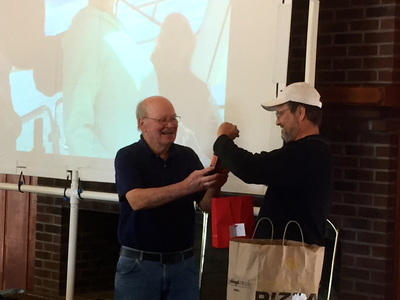 The shipmate award was presented to Steve Twyman and we enjoyed some special entertainment from all our 2015 event hosts as they told us what to expect this season. Our resident architect, Nathan Maune presented plans for next weekend’s patio project and the club unanimously agreed it was a worthy club effort to participate and support. Charles Robinson, SCM is supplying the materials, grading and site prep, while SCYC will provide the labor to lay the pavers. Darren Wohl presented our first Share Series with a very important discussion about Boating First Aid, for which we all benefited from. A big thanks to my fellow officers: Diane, Laura & Doug plus all contributors to the meeting, making it truly a group voice and effort! 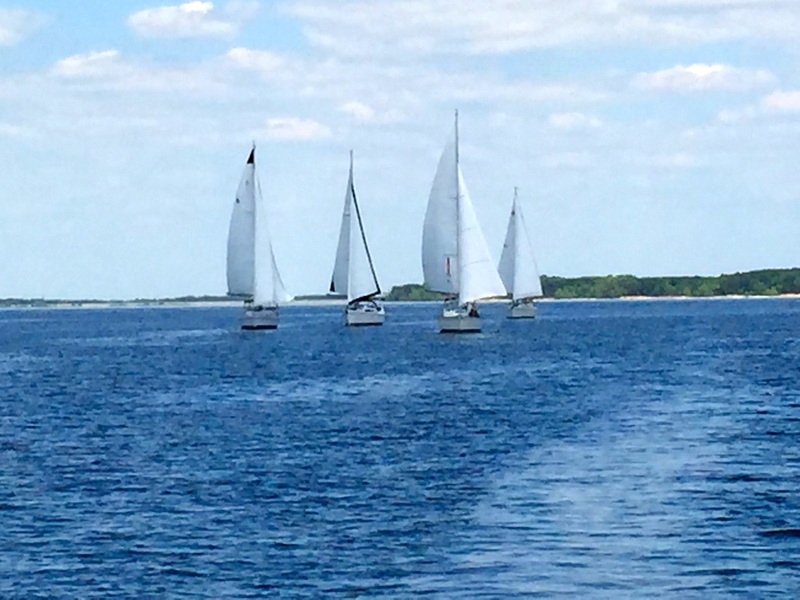 We’ve had two Fun Races already this season with March’s first place finishers: Fleet A- Tenacious, Fleet B- Audacity and April’s first place finishers: Fleet A- Godspeed, Fleet B- BrendaGail. Congrats to all the participants as they continue to raise their skill levels and thank you to race committee chairs, Eddie and David for their great races and fun course designs. A busy April also brought us two more Share Series: Mark Alexander energized us (sorry for the pun) with math equations Watts=Amps x Volts in his discussion about “Everything You Wanted to Know About Batteries, But Were Afraid To Ask” and even had handouts! Glenn Withrow inspired us with his “Younger Next Year” discussion to challenge us this year with better food and exercise choices and the benefits of loving relationships. The evening was capped off with Mark and Meryl’s delicious International Dinner and annual Flea Market to trade and sell our slightly used boating treasures. Finally, this past Saturday, Helen’s talents led a group of members in a sewing event that is utilizing old sails to keep us dry and warm when we gather at the gazebo. I believe we’ll need more help to continue this project but great progress has been made thus far. Thanks for your great contributions, Mark, Meryl, Glenn and Helen. Looking ahead, May 2 we have “Ladies at the Helm” event with Meryl Masters-Alexander and together, from a woman’s POV, we will learn how to improve our sailing skills. Also, that same day we are fortunate to have our fourth Share Series discussion: “Reiki: The Healing Touch” with Rhonda Ivey. It’s been a great spring with more fun times ahead. Hope to see you at the lake soon!